All primary grades. 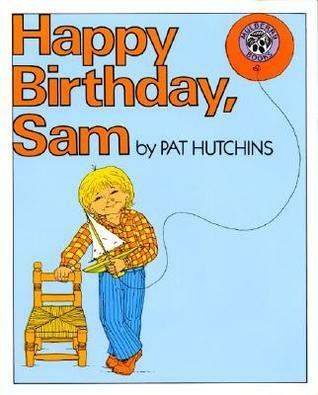 "Sam's birthday brings a solution to several of his problems. "An adorable story of a boy who is still too little to do the things he wants to do, until his grandpa's present arrives. A story all small children can relate to. Sam gets a little chair for his birthday. Alissa could relate to that; she has a favorite wooden chair she loves. A story about the joys of gaining independence. The small chair Grandpa gives Sam for his birthday allows him to do numerous everyday tasks (getting dressed, turning the lights on, etc) without calling for help. I expect that many parents would distinctly remember a similar feeling after getting their driving licence!The one thing I don't get is why did Grandpa send the chair via the post when he was going to turn up later that day for the birthday party? I really like this story of how a boy receives a present that allows him more independence. 1/9/12This went over really well! I had to turn my MLK program into more of a birthday program, because the classes didn't make it due to rain and I had mostly toddlers. 1/16/13Used again for birthday/MLK Story Time and had 2 Sams attending. Great read for kids who don't quite understand that a birthday doesn't exactly mean they've grown up overnight. But the best thing about this book is that Sam doesn't get discouraged, instead he uses his intellect to solve his problems, which is definitely something I can get behind. The first book I ever read aloud. I was so pleased, and so fitting with the content. Great book to do a picture walk with. In this story, Sam is not tall enough to do things. On his birthday, his grandpa gives him a chair and he uses this chair to his advantage. I like the story itself. It is definitely something all children can eventually relate to. Didn't love the illustrations. Pat Hutchins is a great illustrator. The story is simple but it's rung true for every kid I've read it to. I suppose that's why I liked it so much as a kid. Pat Hutchins - Pat Hutchins is an English illustrator and writer of children's books.She won the 1974 Kate Greenaway Medal from the Library Association, recognising the year's best children's book illustration by a British subject. The work was The Wind Blew, a picture book in rhyme which she also wrote. It shows how "a crowd of people anxiously chase their belongings" in the wind.